Independence City Code identifies seventeen (17) conditions which can cause a structure to be deemed dangerous. 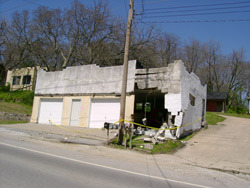 See the City of Independence web site to view the entire section of City Code which addresses dangerous buildings. Those whose exterior or interior walls or other vertical structural members list, lean or buckle to such an extent that a plumb line passing through the center of gravity of any such wall or vertical structure members fall outside of the middle third (3rd) of its base. Those which, exclusive of the foundation, show thirty-three percent (33%) or more, of damage or deterioration of the supporting member or members, or fifty percent (50%) of damage or deterioration of the non-supporting enclosing or outside walls or covering. Whenever the stress in any materials, member or portion thereof, due to all dead and live loads, is more than one and one-half (1-1/2) times the working stress or stresses allowed in the Building Code for new buildings of similar structure, purpose or location. Weather-resisting qualities or characteristics required by law in the case of a newly constructed building of like area, height, and occupancy in the same locations. Whenever any portion or member or appurtenance thereof is likely to fail, or to become detached or dislodged or to collapse and thereby injure persons or damage property. Whenever any portion thereof has wracked, cracked, warped, buckled or settled to such an extent that walls or other structural portions have materially less resistance to winds or earthquake than is required in the case of similar new construction. The deterioration, decay or inadequacy of its foundation is likely to partially or completely collapse. Those, as determined by any official law enforcement agency, that has been used for the illegal manufacture or storage of a controlled substance as defined by this Article. Those under construction, or a fire damaged structure upon which no current building permit is held and no substantial work shall have been performed for the immediately proceeding thirty (30) days, and such conditions or defects exist to the extent that the life, property or safety of the public or its occupants are endangered. Whenever any portion of a building or structure remains on a site after the demolition or destruction of the building or structure. Those which are used or intended to be used for dwelling purposes, because inadequate maintenance, dilapidation, decay, damage, faulty construction or arrangement, inadequate light, air or sanitation facilities, or otherwise, is determined by the Building Inspector to be unsanitary, unfit for human habitation or in such a condition that is likely to cause sickness, disease or injury. Whenever any building or structure, because of obsolescence, dilapidated condition, deterioration, damage, inadequate exits, lack of sufficient fire-resistive construction, faulty electric wiring, gas connections or heating apparatus, or other cause, is determined by the Fire Inspector to be a fire hazard. Whenever any door, aisle, passageway, stairway or other means of exit is not of sufficient width or size or is not so arranged as to provide safe and adequate means of exit in case of fire or panic. Whenever the walking surface of any aisle, passageway, stairway or other means of exit is so warped, worn, loose, torn or otherwise unsafe as to not provide safe and adequate means of exit in case of fire or panic. Whenever any portion of a building, or any member, appurtenance or ornamentation on the exterior thereof is not of sufficient strength or stability, or is not so anchored, attached or fastened in place so as to be capable of resisting wind pressure of one half of that specified in the building code for new buildings of similar structure, purpose or location without exceeding the working stresses permitted in the building code for such buildings. Whenever any building or structure has been constructed, exists or is maintained in violation of any specific requirement or prohibition applicable to such building or structure provided by the building regulations of this City, as specified in the building code or housing code, or of any law or ordinance of this State or City relating to the condition, location or structure of buildings. Those buildings which are abandoned for a period in excess of 6 months so as to constitute such building or portion thereof as an attractive nuisance or hazard to the public, in which the electrical, plumbing, mechanical, or other systems are totally or partially damaged, destroyed, removed, or otherwise made inoperable, unsafe or unsanitary, or such conditions or defects exist to the extent that the life, property or safety of the public or its occupants are endangered.